There will be plenty of times where you're loaded close enough to the legal weight limits that you'll have to watch how much fuel you're carrying. You'll also have to watch how much fuel you put in when you're fuelling, and calculate when it will be ok for you to fuel up the next time. 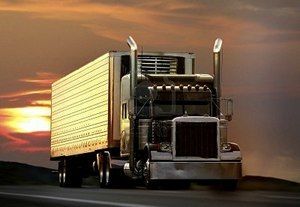 The weight of the fuel itself and the placement of the fuel tanks will both have an effect on fuel management and weight distribution while hauling loads close to the legal limit. The precise weight of diesel fuel will vary based on temperature and humidity, but is generally around 7.25-7.5 pounds per gallon. So the safest bet is to use 8 pounds per gallon as the number you'll plug into your calculations, and that's what we're going to use here. The weight of the fuel in your tanks will be distributed mostly to your steer axle, with some going onto the drive axles. The percentage of weight that goes to each set of axles will vary from truck to truck based upon the placement of your tanks relative to your steer and drive axles. The best way to determine what percentage of your fuel will go to each set of axles is to weigh the truck immediately before and after fueling, and do a simple calculation. 700/800 * 100 = 87.5% went to the steer tires, and 12.5% went to the drive axles (100% - 87.5% = 12.5%). Now anytime you get fuel you'll know exactly where the weight will go. 100% - 80% = 20% went on the drive axles. What is the correct method of determining what percentage of fuel is distributed between the steer axle and the drive axles? Weigh the truck, then immediately fuel up, and then immediately re-weigh the truck to see what percentage of the added weight went to the steer axle, and what percentage went to the drive axles. Weigh the truck immediately after fueling, then run exactly 100 miles, and then re-weigh the truck to see what percentage of the added weight came off the steer axles. Weigh the truck, then drive exactly 100 miles, and then re-weigh the truck to see what percentage of the added weight went to the steer axle, and what percentage went to the drive axles. Weigh the truck after running 100 miles, then immediately fuel up, and then re-weigh the truck to see what percentage of the added weight went to the steer axle, and what percentage went to the drive axles. In order to accurately determine what percentage of fuel weight goes to your steer axle versus your drive axles you can simply weight the truck, then immediately fuel up, and then immediately re-weigh the truck to see what percentage of the added weight went to the steer axle, and what percentage went to the drive axles. 100% - 67% = 33% went on the drive axles. 100% - 75% = 25% went on the drive axles. Where will the weight of fuel be distributed? Mostly to your drive axles, with some going onto the steer axle. Mostly to your steer axle, with some going onto the drive axles. The weight of the fuel in your tanks will be distributed mostly to your steer axle, with some going onto the drive axles. What is the best way to determine what percentage of the weight of fuel will go to each set of axles? What is the safe number to use in calculations for the weight of fuel?